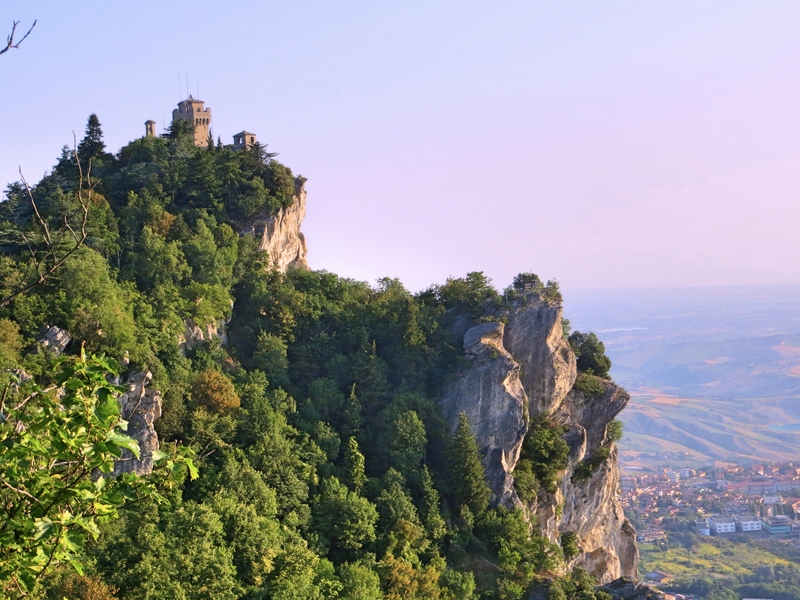 There’s really only one reason to go to San Marino: so you can check off one more country. Even though its historic center and three ancient castles are UNESCO World Heritage sites, there’s really not much to see and even less to do here. We did, though, check off our 55th country since leaving the USA in 2013 and – for each of us now – our 93rd country overall. San Marino, or, as it’s known as in Italian, Serenissima Repubblica di San Marino (The Most Serene Republic of San Marino), has many claims to fame. It claims to be the oldest surviving state and republic in the world, based on the founding of a monastic community in 301 AD. It is generally accepted that San Marino’s 16th century Legal Statutes of San Marino are the oldest written governing texts still in effect. At 24 square miles, it ranks 190th of the 193 sovereign nations recognized by the U.N. in terms of size (Tuvalu, Nauru, and Monaco are the smallest). With about 32,000 people, it ranks 188th in the world in terms of population. The only countries with fewer people are all South Pacific island countries. And my favorite, it ranks at the top of the list in terms of most vehicles per person. 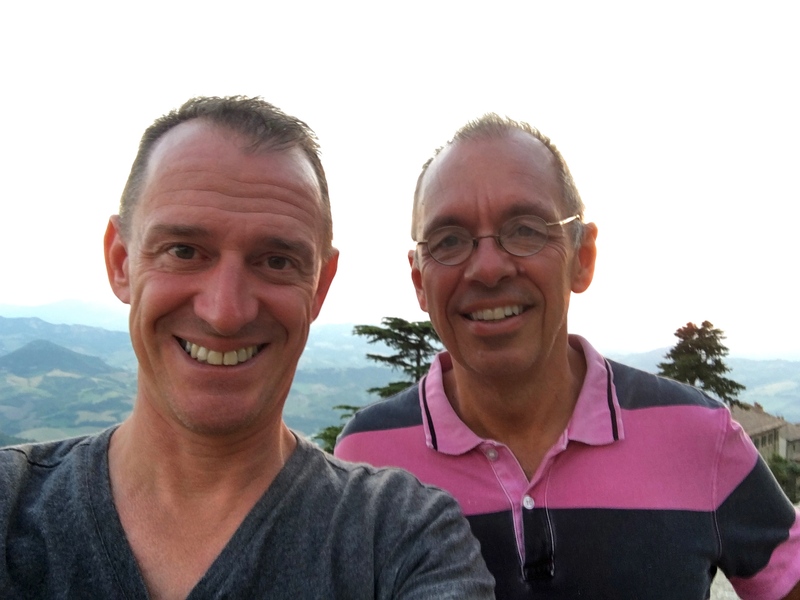 There are 1.26 motor vehicles per person in San Marino, compared to 0.81 vehicles per person in the U.S. (4th on the list) or – to go to another extreme among countries we’ve visited on this adventure – 0.007 vehicles per person in The Gambia. 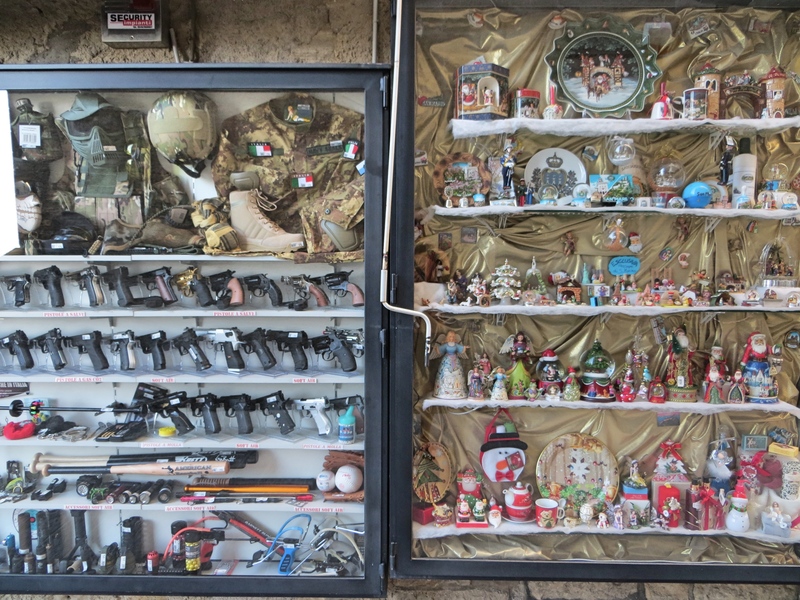 Oddly, there are lots of stores selling deadly weapons in San Marino: hand guns, rifles, crossbows, knives, you name it. I liked this one, right next to a store selling Christmas ornaments. 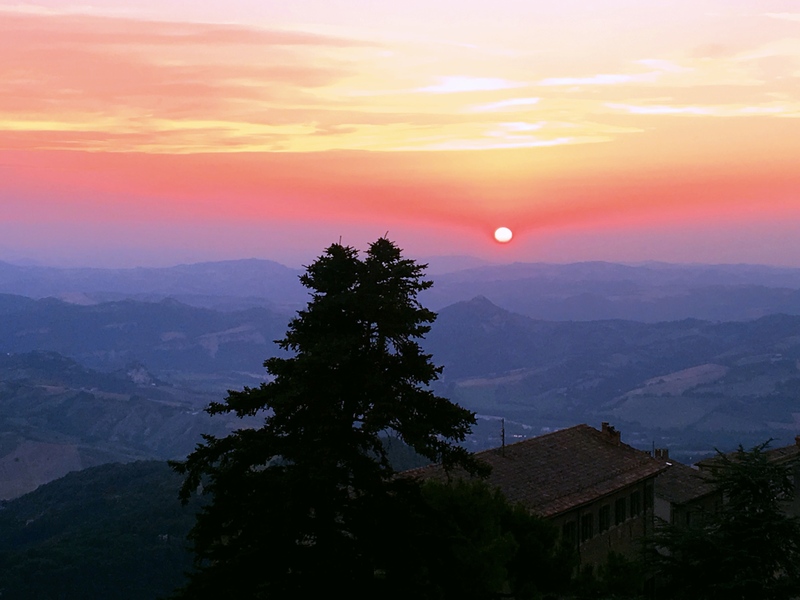 How did this tiny and peculiar country, surrounded entirely by Italy, come to be? First off, you have to see it to believe it. 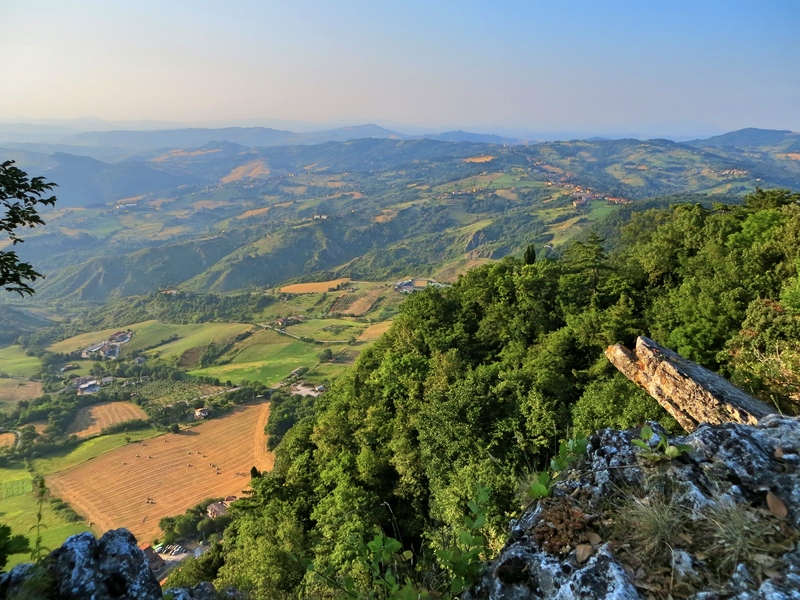 As you approach San Marino from the Adriatic coast, it sits on this steep, jutting mountain, Mount Titano that practically leaps up from the plains of Umbria. Well, back at the very start of the 4th century AD, Emperor Diocletian ordered that Christians across the empire be persecuted. Marinus, a stonemason from what is now Croatia fled first to Rimini, across the Adriatic, and then up the mountain where no one could get to him except his fellow Christians. When you see the impregnable Mount Titano you understand why he thought he’d be safe there. 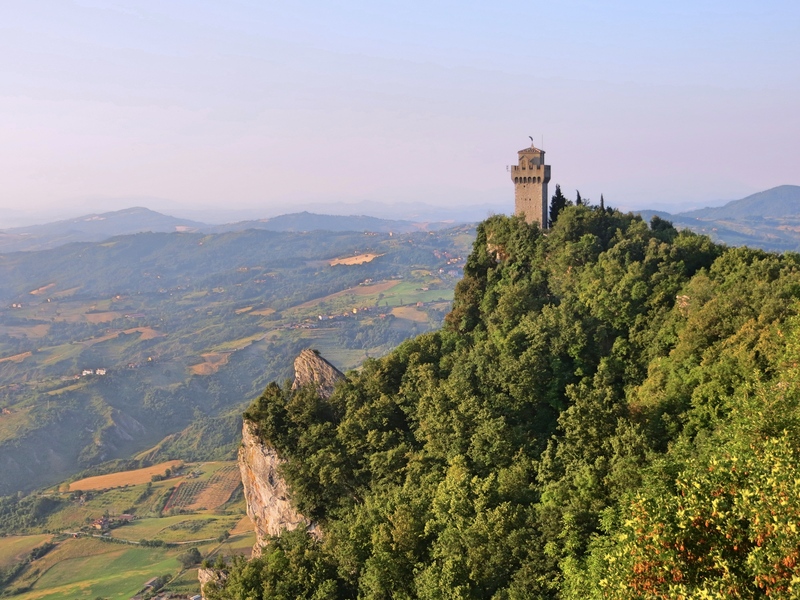 From that humble beginning, San Marino became one of innumerable Italian city-states, with the pope recognizing its independence in the 17th century. But there were lots and lots of Italian city-states back then: Genoa, Pisa, Florence, Venice, Milan, and on and on. But why did San Marino become an independent country when the rest of them joined together in the mid-19th century to become today’s Italy? Basically, it was a favor. During the 19th century Italian unification process, San Marino was a refuge for unification supporters who were persecuted by its opponents. As Giuseppe Garibaldi (think George Washington with an Italian accent) succeeded in linking the various parts into a single country, he simply agreed to let San Marino alone in thanks for its support. There you have it. A tiny European country, part of the United Nations and the Council of Europe, but not the European Union or the Eurozone (though it uses the euro as its currency). Small as it is, it has a surprisingly healthy economy based on finance and tourism. There is no national debt and the country routinely runs a budget surplus. I’m intrigued by its economic health: When Scotland voted last year on whether to become an independent country, a major strike against independence was the belief that it’s economy was simply too small to stand on its own. If San Marino can succeed, why wouldn’t Scotland? What do you do in San Marino? Not much, really. You can shop, but we don’t buy anything except toiletries. 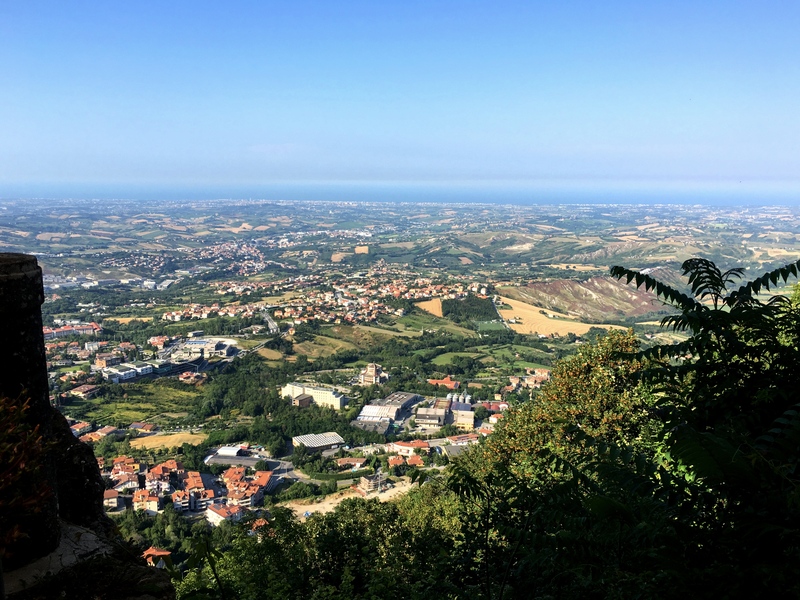 There’s a nice little hike connecting three old towers that run along the mountain ridge facing the Adriatic, but that takes about an hour or so and then there’s … well … not much. I mean, it’s cute and all, and the historic center definitely has an old medieval feel to it. And it has great views from way up on the mountain. But there’s really not much to do. 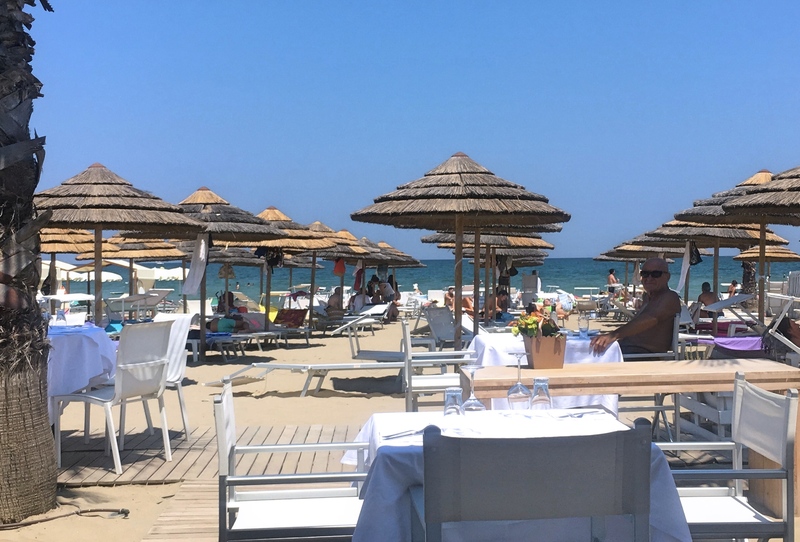 So, since we’d booked two nights at a hotel there, we took a day trip down to the beach at Rimini where we lazed in the sun and I went for a run. And then proceeded to forget my running shoes on the beach when we left. 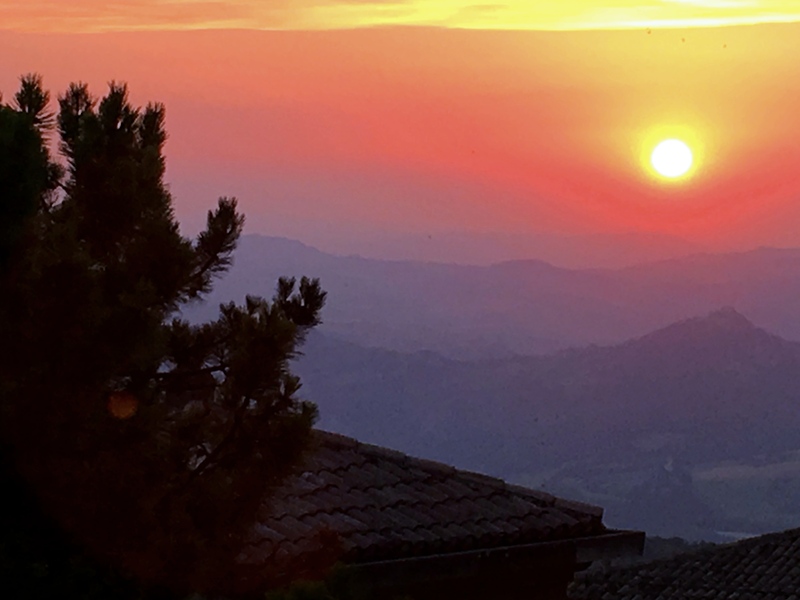 Except for that little catastrophe, though, We found the notion of leaving San Marino for the day and then coming back amusing, as the typical visitor to San Marino is taking a day trip up there from Ravenna or Rimini or even Florence. The city streets are measurably more crowded during the mid-day when tour buses drop hordes of people off so they, like us, can check this city off their list than they are in the early morning or evening. 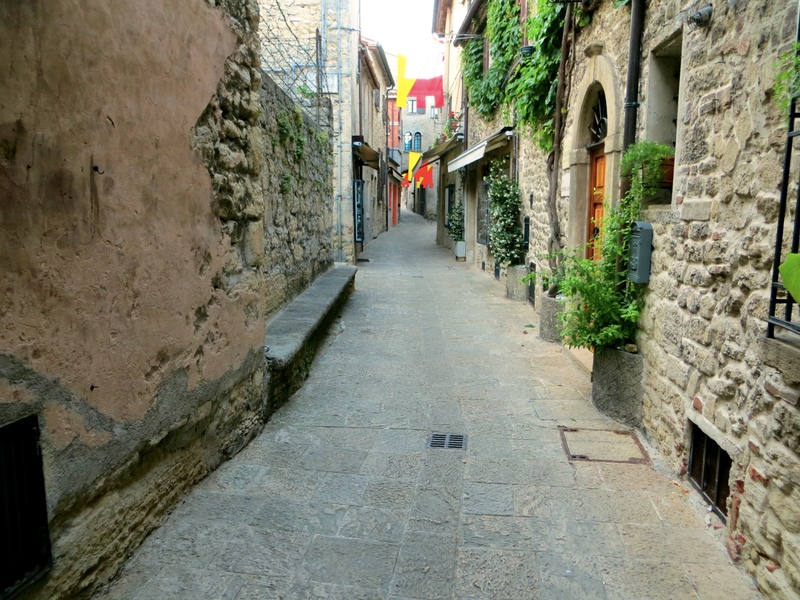 We felt like the only people in the world who take a day trip out of San Marino. From here we’re headed back to the beaches of Rimini for a few days and then … well, we don’t know. We’re still making it up as we go along until we meet our friends Dan and Laura and Charlie and Elizabeth in Florence the last week in July. There’s the start of a great sunset behind us. The camera apparently had a choice of capturing us or the sunset, but not both. The first of the three protective towers along the crest of Mount Titano. You get a sense from this shot just how steep and high the cliffs are. And our little beach excursion. Nice day, nice beach, just a little strange to come down here when we were supposed to be up on a mountain.